So my daughter is in pre-school. Her Valentine's party was on the Friday before Valentine's day, and I wanted to do something other than candy. She is only 4 and they get soooooooooooooo much candy. She is an only child so she doesn't have siblings to pawn the candy off on, and it sits in the house until someone eats it.........meaning me. I did not want any more candy in our house! Oh and I should mention, I didn't start this project until the day before the party. I went to Target and strolled the toy isles until I found something different. And I was struck with inspiration! 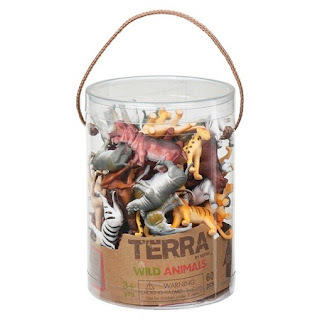 I wanted something farm related, but settled on this tub of wild animals. 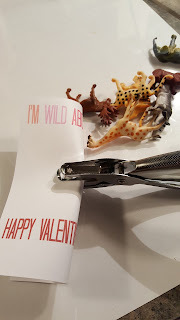 Now let me just say, this is not a sponsored post in any way, but if Target is reading this I would not be opposed to writing one : ) I decided to write out little sayings related to each animal on card stock. I quickly created the design in PicMonkey which is an amazing web site to create designs, again not sponsored, but I LOVE PicMonkey! I wanted a design that would appeal to both boys and girls, without being too pink yet still feel valentinesish. 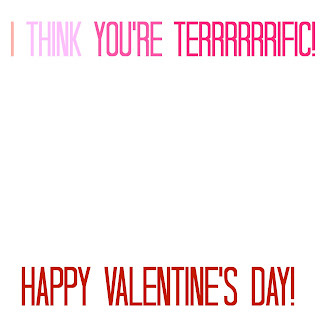 I decided to do an ombre pink for the saying at the top and then a deep red for the "Happy Valentine's Day" part. I then saved all of the pictures on my computer and created a document with four of the sayings to a page. 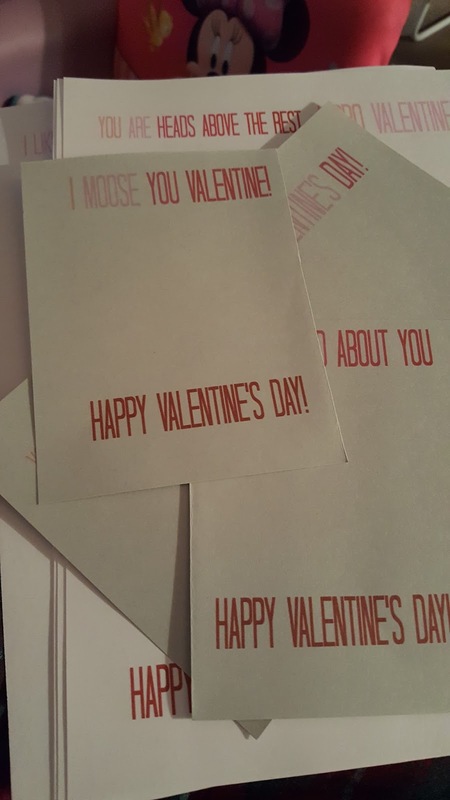 I printed them on card stock and cut them out. Once they were cut out, I wrote "From: Ella" on the back and let her write a personal message too. Then I bent the card in half, and used a hole punch to create two holes in the card. 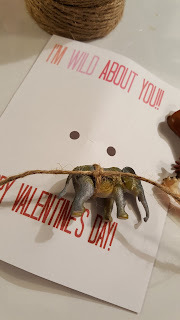 I used left over twine from another DIY project and tied a knot around the animal and tied the animal to the card. And we were done! Super easy! The longest part was cutting all of the cards out....no wait, it was waiting for Ella to personalize each card. She was very detailed in her messages to her friends. Mostly a lot of circles and her name written really large on the card. 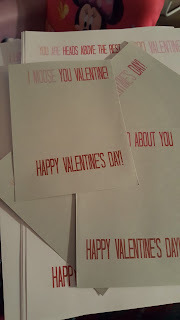 Here is a link to the PDF file for the cards. I added a faint grey line for you to follow when cutting out the cards. I tried to make a saying for each animal, but what is an appropriate saying to write about a camel for 4 year olds? 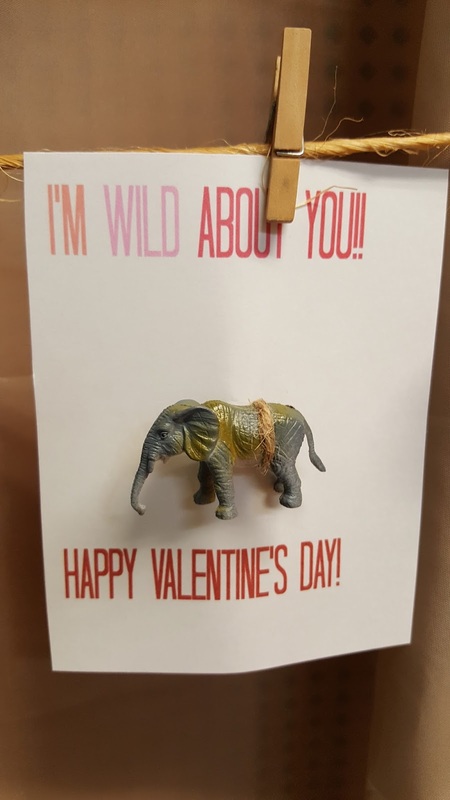 I could not think of one, so I just used the "I'm Wild About You" card. The most expensive part was the animals, I believe they were around $6.00 and I had all the other parts around the house. I figured it was well worth spending $6.00 to not have any more candy in the house!